There’s no two ways about it: Dropbox has changed the way we work. It’s been especially great for designers, artists, musicians and other creative types, not only for showing off work, but also for collaborating and sharing work with clients, colleagues and fellow artists. This doesn’t mean it’s perfect, though. Dropbox doesn’t have much of a visual sharing interface, and you still need to use email or messaging to leave comments and suggestions. Which is why Sitedrop is going to be its new best friend. 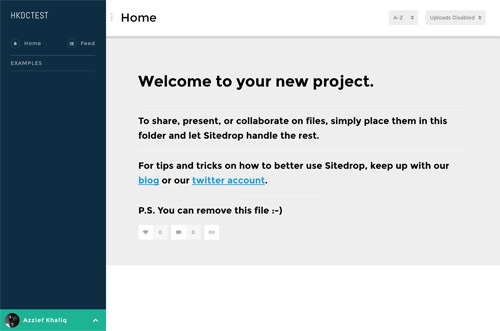 Sitedrop is a web service that links to your Dropbox and turns the contents of any of your Dropbox folder into a stylish, visual-based website. Basically, it lets you skip over building a site when all you want to do is get some feedback on your work. And this becomes as easy as dropping a file into a folder. Let’s check out how this is done. Registering an account with Sitedrop requires your email address; no social media account sign-ons for this service. After that, link your Dropbox account to the Sitedrop account. 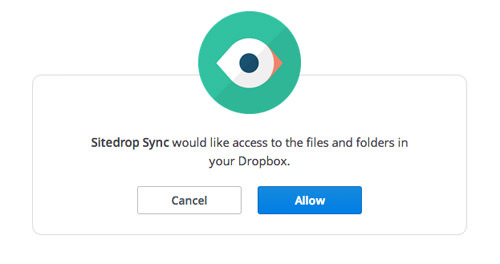 Allow Sitedrop Sync to access your files and folders by clicking on Allow when prompted. Now, let’s set up your site. The name you give to the site will also be your subdomain URL. Create a folder, or choose a specific, already-populated folder to "upload" to your site. When you’re done, press Create and Sitedrop will create the site for you. You will then be taken to the dashboard view, named Your Sites. Here is where you can create more new sites, and manage multiple sites from one central hub. Each website you have is displayed as a separate "card", with the title, URL, Dropbox folder, number of files and number of contributors displayed. To edit the contents of a particular site, click on the gear icon at the lower right of each card. Now that you have your site ready, this is the basic layout of your site. Well, it will be if you have not uploaded any files or deleted any of the example files. It is currently the only layout you can use (until the developers provide options for more layout designs). The fun thing about Sitedrop is that you manage (and add) content entirely through your Dropbox. 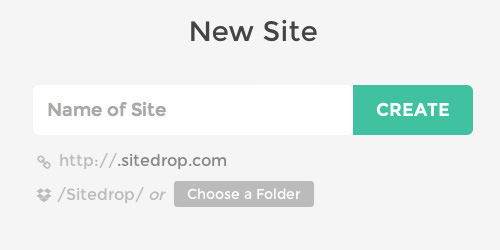 Any changes you make to your Dropbox folder or subfolders, will be updated on the site automatically. To add more links to the sidebar, you just create a new subfolder in Dropbox, then drop in your content into the subfolder. The new folder will appear as a new link in the sidebar. 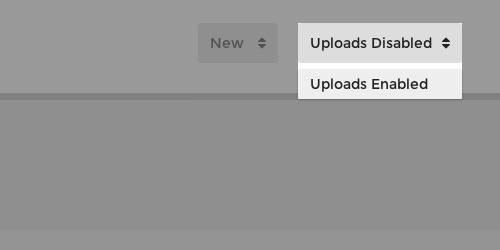 You also have the option of enabling uploads directly from within the site, quite handy if you want to drop something into the site, but don’t have access to your Dropbox. Just take a look at the upper right of your Sitedrop and select Uploads Enabled from the drop-down menu. Sitedrop supports most current popular file types. 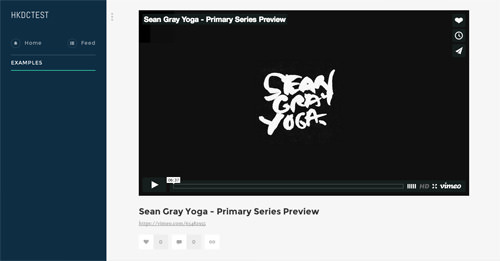 Almost any file type will display on the site, alongside a small preview icon, but not all files will show as full previews. 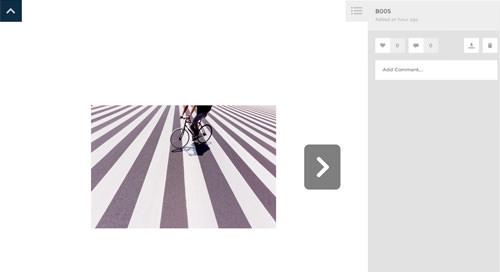 Image files, including animated GIFs and Photoshop PSD files, will display directly on the site. 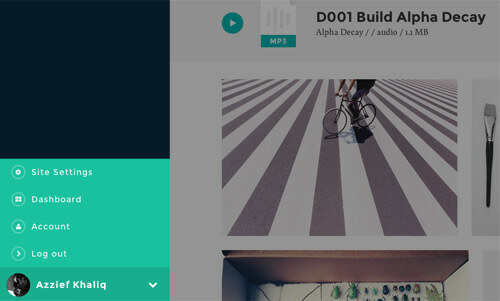 Sitedrop will also display off-site media such as videos from YouTube and Vimeo, albums on Rdio and SoundCloud playlists; just upload a URL and the media will display inline. Audio files such as MP3s are also supported, and will also display inline. They can be played directly from the Sitedrop interface. Text files, like the "Welcome to your new project" file from one of the earlier screenshots, have to be uploaded as Markdown documents. Sitedrop will convert the Markdown documents to HTML automatically. There’s also a secondary lightbox-style view view that is accessible by clicking on any of the listed files or by accessing files directly via the individual URL. In this view, you can navigate using either the arrow keys or the large onscreen keys. 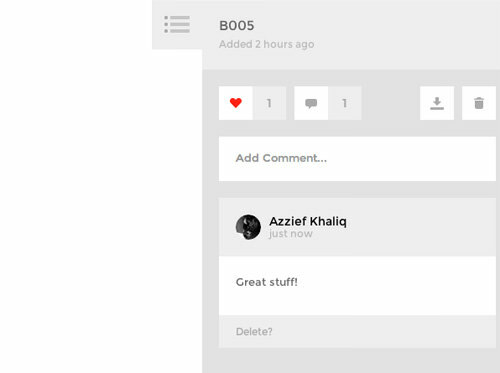 This Lightbox view is also where you can see and leave comments and favorites. You can see both the comments and favorites for a particular file on the right side of the lightbox view. There’s also an Edit Site screen you can access, with some options to tweak your Sitedrop site. You can access this screen from the aforementioned Your Site screen, or from the Sitedrop menu on the actual site. 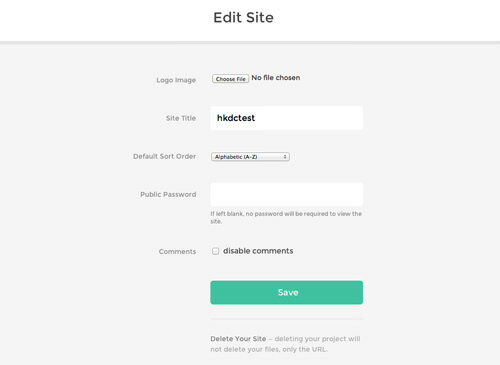 As you can see, you can add a logo image, change the name of the site (but not the URL), change the default sort order for files, set a password as well as enable and disable comments. You can also delete the site (just the URL, the files lie intact). Sitedrop is a service that will definitely be of interest to creative users. Whether you’re looking for an easier and more visual way to share your work with clients, a quicker and simpler way to share your creative work with the world, or need a visual way to manage a collaborative project, Sitedrop is definitely a service you should try out. Sitedrop is currently free to use. The team plans to introduce premium features down the line, including charging for additional sites beyond the first five sites.